In my childhood days, I would purchase these water pistol at my old neighborhood convenient store for not more than a dollar depending on the size of the pistol. It would comes in different color and the range of the shots very much depend on your luck for the pump system as there are very little quality control of those guns. Due to that, the gun doesn't last long. Before you know it, it is either started leaking or the pump system failed to work anymore. Since they are affordable, one can get a replacement easily. Water gun plays an important part in some childhood group games. We would divide ourselves in two team and chase each other around the neighborhood blocks or school shooting at each other. If that was not enough, we would make "Water bomb" with balloons or plastic bag. After such games, we normally will wait for our clothing to be dry before heading home lest our parent discover our mischief. Somehow parents always doesn't like us playing such games, fearing we may catch a cold. 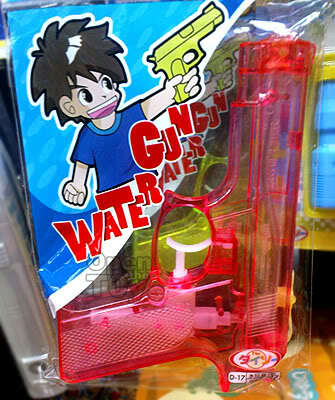 Oh yes, this the water pistol I played when I was a kid as well. Sometime water would even leak out. Ha! Ha! The package from Daiso is very presentable. It is good to see someone who share the same memories of my childhood. Yes Daiso did an awesome job. That what Japanese does best.